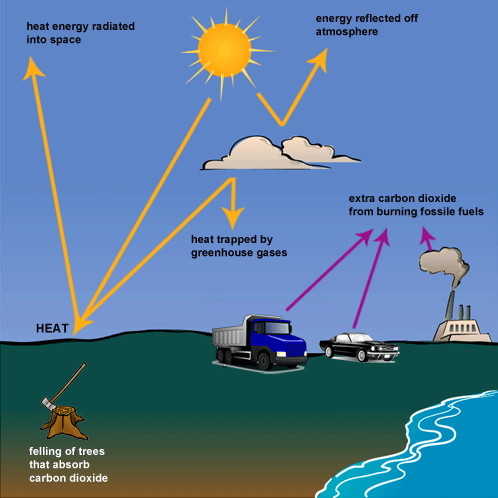 The following diagram shows how greenhouse gases trap energy from the Sun. Complete the answer by filling the gaps with a word or phrase from the box below. Energy from the Sun .................... the Earth as heat. Some of this heat energy is .................... radiated into space, while some of it is trapped by greenhouse gases in the atmosphere and reflected back to Earth. This is a natural process, but in recent ...................., human activities have .................... an increase in the .................... of greenhouse gases in the atmosphere which is now trapping too much heat. One of the main greenhouse gases is carbon dioxide, and extra quantities of this .................... into the atmosphere .................... burning fossil fuels as a source of energy in power stations, factories and homes. Exhaust gases from cars and lorries .................... further emissions of carbon dioxide. Plants serve to remove some of the carbon dioxide from the atmosphere by absorbing it through their leaves. However, as large areas of forest .................... in the Amazon and elsewhere, .................... carbon dioxide is removed in this way.